This post is written by Hannah Henthorne, convention services assistant for Experience Columbus. As the metropolitan hub of Ohio, Columbus undoubtedly has awesome architecture and a plethora of pavement. But it is also home to many public gardens, green spaces and parks - all of which provide locals and visitors with a space to stretch the legs, soak up some solitude, or simply escape the urban rush for a short while. 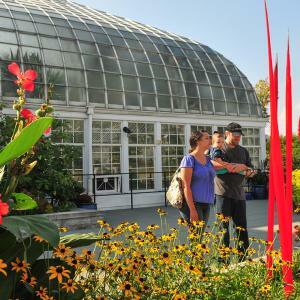 Franklin Park Conservatory is the alpha dog in the public park pack. As a member of the National Registry of Historic Places, this horticulturist’s dream is home to over four hundred plant species, permanent art installations, and educational classes. Watch a butterfly take flight at Blooms & Butterflies, get immersed in immense insect sculptures at David Rogers’ Big Bugs, gaze upon fascinating photographs of caterpillars at the Life of the Leaf Edge exhibit, or admire the intricacies of the Bonsai Show. All of which run through September 27. The Conservatory also hosts educational hands-on classes that range from pasta making to potting succulents to painting with watercolors. Bring an appetite because Wednesdays are Farmers’ Market days from 3:30 to 6:30 p.m., and the Conservatory has a quaint café that serves seasonal salads, soups and sandwiches. 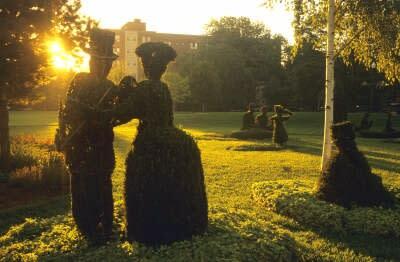 Just minutes from downtown Columbus is the Topiary Park. Sitting on what was once the site of the Ohio School for the Deaf is the only known topiary representation of a painting. The fifty-four hand cut figures and eight boats realistically portray George Seurat’s famous painting, A Sunday Afternoon on the Isle of La Grand Jatte. Meandering through the lifelike topiaries is as if one is living in the work of art itself. Take in the park from the eastern-most hill for the best view. Need replenished after strolling through the park? Head a half mile west to 4th street where a smorgasbord of hip dining options awaits, including Dirty Frank’s, Little Palace and El Camino. Nestled in the hip Clintonville neighborhood just north of the city sits the Columbus Park of Roses. This park lays claim as one of the largest rose gardens in the United States. Opt for mid-June to visit this floral oasis and check out the blooming beauties atop an iron observation tower on the north side of the garden. Spotted throughout this community hot spot are families, first dates, and fitness lovers that choose the park as a stopping point along the Olentangy Trail and Bike Path. Local favorite Northstar Café sits just a couple minutes from the Park. 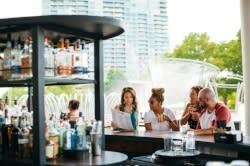 Northstar’s seasonally-sourced, organically-grown menu makes this a perfect stop after admiring the array of roses. Twenty minutes north of downtown in the celebrated suburb of Westerville is the 121-acre metro park, Inniswood Metro Gardens. Over two-thousand species of plants, including herb, rose, and rock gardens attract nature lovers of all ages. The park is full of plush nooks and crannies that attract families, couples, and graduating students for photography sessions. Two miles of hiking trails provide a quick and easy stroll for those who seek an urban escape. Head into Uptown Westerville for a meal at Mediterranean inspired Jimmy V’s or for some classic pub grub at Old Bag of Nails. This list certainly does not boast every public green space in Columbus, but it serves as a solid starting point for those aiming to get near to nature without venturing too far from the city.